Theming is a very powerful tool used in content management systems. Styling toolkits are choice of many teams designing reusable or open source systems. The goal is to extend the provided system with custom styles. Unnecessarily complicated theming solutions are common. Often hard to maintain, improve or update. Changes in styling are very costly to test. Libraries and system can change over time with new releases and introduce breaking changes regularly. Teams need to have discipline when working with theming. Setting and following rules can have a great impact on the maintainability of the project. Toolkits provide style guide with components and default styling which is very useful for prototyping. Some toolkits use SASS preprocessor and allow changes in the styling using variables or by adding custom CSS. Minified Toolkit and a separate file with CSS overrides. In some situations, it is the fastest way to deliver small changes. On the other hand, changing primary color can lead to hundreds of lines of code to be written. Do not use this approach since you will end up shipping large Toolkit CSS and large overrides. If you use whole bootstrap toolkit then your pages will use in average less than 2% of the styles. You will be shipping a lot of unused code. The problem with unused styles was very common. Former versions of Bootstrap had online customize and download tool to get your version of the toolkit with custom variables and only components you needed. Creating one minified CSS file containing toolkit code and customizations together. Sass variables are very powerful API provided by Toolkit creators. One variable can be used across the toolkit and change look of many components. Size of the output file can be lovered by disabling components that are not used by the specific application. Bootstrap 4 is using Sass variables for global style preferences. 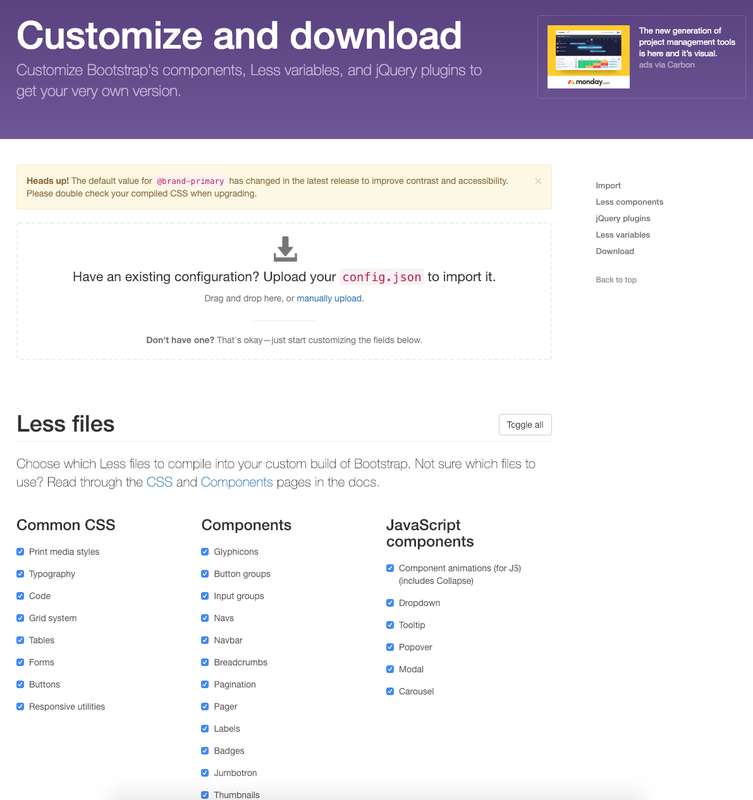 In your, custom.scssyou’ll import Bootstrap’s source Sass files. You should only pick the parts you need. Every Sass variable in Bootstrap 4 includes the!default flag allowing you to override the variable’s default value in your own Sass without modifying Bootstrap’s source code. Copy and paste variables as needed, modify their values, and remove the!default flag. Read more in Bootstrap section about theming.